Can Dedication Ceremony be used to place advancement tokens on a rezzed Haas Arcology AI? Yes. Dedicated Ceremony does not specify to put the tokens on a card that can be advanced, and rezzed cards are faceup. Does Dedication Ceremony trigger the abilities on public agendas like Oaktown Renovation? 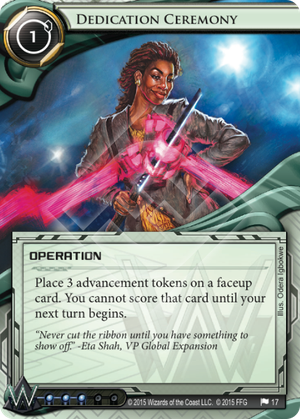 No, the action of advancing a card places advancement tokens, but placing advancement tokens through other effects does not count as advancing a card. Poor old Weyland only got a single card in this pack, and it's a real tough one to use effectively. I'm gonna comprehensively cover every card it interacts with, from the "meh" to the downright disgustingly good. "Faceup" means that ice and assets have to be rezzed, and agendas have to be Public, limiting the pool to Weyland's Renovations and agendas targeted by Casting Call. That leaves 3 types of cards that you can combine with Dedication Ceremony: Public Agendas, Advanceable Ice, and Advanceable Assets. Let's go through each of them in turn. Underway Renovation trashes 7 cards for 5 credits normally, and with Dedication Ceremony, it trashes 8 cards for 5 credits. I wouldn't play a card that milled a single card for 0 credits even if it didn't require an agenda on the table. Pass. Oaktown Renovation gains 5 credits normally, and with Dedication Ceremony you can reach 7 credits over the course of 2 turns advancing. I know, that's a worse Beanstalk Royalties. Uggh. Install Hollywood Renovation/Dedication Ceremony/advance // Install Project Atlas/advance, placing 1 counter on Project Atlas/advance, placing 2 counters on Project Atlas/score both for 5 agenda points. As a three card combo, however, and a fast advance strategy that requires an agenda already on the table (defeating the point of playing fast advance in the first place), I'm afraid I can't see this strategy appearing outside some janky decks. So let's move on. What about advanceable ice? Well, the closest comparison I can make is Patch, a card that already rarely sees play. For most ice, Dedication Ceremony is a credit more for a credit extra tax, which is not a terrible improvement, but it can't touch non-advanceable ice. I wouldn't recommend building a deck around it, but as a potential side-use of one of the other strategies it's not completely terrible. Allele Repression: recurring 3 Scorched Earth's for 2 clicks and 3 credits isn't bad. Ronin: A really interesting reason to run Dedication Ceremony in Jinteki: it let's you fire an unadvanced Ronin for 2 credits and 3 clicks. Haas Arcology AI: Yeah, I knew you had to mouse-over that card. Dedication Ceremony gives Haas Arcology AI a chance to make something of itself: remember once again that placing advancement tokens is not the same as advancing, which means that Haas Arcology AI can be targetted with Dedication Ceremony when rezzed. If it's ability could be used multiple times in a turn, there might've been a hope to quadruple Scorched Earth the runner, landing it a place in some real tier 1.5 decks. As it stands, it can act as a poor man's Director Haas. Which is... OK? Search it out with Executive Boot Camp. GRNDL Refinery/Reversed Accounts: this combination is why I wrote this review in the first place. If you don't see it: Install asset/Dedication Ceremony/fire to gain 12 credits or make the runner lose 12 credits. all at the cost of a single credit. If you were wondering, the reason why Dedication Ceremony makes such a difference to the playability of those cards is the 1-turn factor. If you have to stick it a scoring remote, it can be trashed, leaving the click investment wasted. Gaining 12 is pretty astounding: it's a similar credit swing to the ol' Oversight AI/Curtain Wall combo in Blue Sun: Powering the Future, but without the risk of failure (note: with the exception of the upcoming Councilman, the runner cannot stop this). But the latter is ridiculous. 12 credit loss is like a corp-side Vamp, opening up scoring windows by sheer force. On top of that, runners tend to have control over their credit pool and never let themselves dip too low, which means they lack economy cards that can even be played at a couple of credits. In Blue Sun: Powering the Future, the large ice you use guarantee a scoring window if not two, and the credit swing can put you back into SEA Source range. I like rezzing a Corporate Town at the beginning of my turn to trash a loaded Kati Jones, then they get to see their economy get ripped to shreds as they scramble up the 5 credits needed to trash it. Meanwhile, Spark Agency: Worldswide Reach can send the runner back to the early game before they escaped the advertisement trap and keep them there with City Surveillance. It's so good I'm putting it in the "Tier 1.5" category. Take it to a GNK and proceed to make some stories. Moral of the story? Don't sleeve it up with your Renovations. Cut the ribbon with something that you really want to show off. People's thought process with this card has been pretty one-dimensional. Use it on the series of face-up agendas Weyland has and it's like a psuedo fast advance, yeah? Casting Call something better out and then slap this on it. Use this on Woodcutter or Mumbad Construction Co.. There's a lot of potential for this card people are missing.